​Recipient of the 2015 Lucille Medwick Memorial Award, Meek (Road Scatter) weaves travels through Botswana, Namibia, and South Africa to honor her recently deceased mother with trips she took in this country with her sister and ailing father, recalling a sometimes fractured family. What’s remarkable is that Meek does not stoop to the journey-as-healing narrative one might expect. Instead, she puts us in panoramic settings that in their bristly, sun-seared particulars represent her brittle emotions; she doesn’t take herself (or us) comfortingly out of the world but shows us baby seal hunts and the noble Welwitschia mirabilis, surviving in the brutally arid Namib desert, surrounded by landmines left after Angola’s bid for independence and memories of Germans slaughtering the Herero and Nama people in the early 1900s. “What’s lost// most remains” she says of dry grass-thorn—and of so much else. VERDICT Meek’s lines are dense and challenging but worth every effort. "These lush and sensory poems take the reader many places, both exterior and interior, from The Skeleton Coast of Namibia and across savannahs of linguistic imagination. This is a deeply textured, brilliant book." 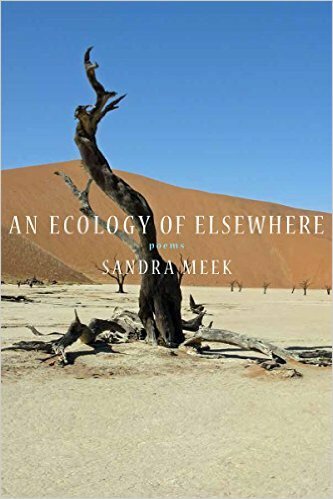 "With incendiary eloquence, Sandra Meek creates a cosmos of “ologies”— biology, cosmology, etymology, entomology, philology, ecology. With an intelligence as intimate, universal, ferocious, and phenomenal as the fires (literal and figurative) that course through these poems, she travels fluently, apostrophically, and provocatively among the “words of this world” and the worlds of the word, attending the “-logos” that brings all “elsewhere” here and that grounds each and every one of her teeming, prodigious forays into gnosis."